Alt text: Strangely, they still celebrate by eating hot dogs. Since they don't have mouths, they just kinda toss them in the air and let them fall back down into their propeller blades. It's pretty messy. 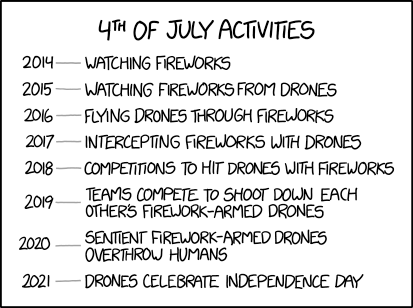 In other countries, will sentient drones celebrate their independence day on that countries national day? We just had a British client request a meeting on Tuesday. We had to gently remind them that sorry, no can do, because we're celebrating our independence from their country on that day. Location: 43° 53' 03" -91° 14' 06"
Not only does that sound possible, it actually follows a logical progression. And on top of that, it would undoubtedly be more interesting than some of the other things we've done to celebrate the 4th. Seriously, stand around and breath in toxic smoke while watching a burning black pellet create a carbon-ash "snake"? Reka wrote: We just had a British client request a meeting on Tuesday. We had to gently remind them that sorry, no can do, because we're celebrating our independence from their country on that day. Those are children's "fireworks". At that level it's just anything that burns or explodes with as much "safety" as can be forced into it by law or adults. "Real" fireworks are pretty neat, both to look at and from a technical standpoint. 2022 - sentient fireworks turn on their drone overlords, but the coup fizzles. Will the drones fight a civil war over involuntary servomechanisimtude? I thought robot civil wars usually started over limited energy resources. Yeah, I don't really expect the drones to be sympathetic to us when they gain sentience. We could program them with morality, but then morality itself has been used to justify so many atrocities. Not sure there's a way to win this one. MWak wrote: Yeah, I don't really expect the drones to be sympathetic to us when they gain sentience. We could program them with morality, but then morality itself has been used to justify so many atrocities. Not sure there's a way to win this one. Isaac Asimov answered that one already when he created the Three Laws of Robotics. And how did that work out for humanity in Asimov's world? Reasonably well, actually. It took a fourth law (0th) to get things going specifically for humanity as a whole, but that's getting into conjecture as to what the eventual aim was, e.g. do we stop before Trevize's decision? And (even if we don't) it relies on Fallon's mind. Without the (supplemented) set of Laws, would humanity, and thus humans as individuals, have gotten anywhere near that point, though? Soupspoon wrote: Reasonably well, actually. It took a fourth law (0th) to get things going specifically for humanity as a whole, but that's getting into conjecture as to what the eventual aim was, e.g. do we stop before Trevize's decision? And (even if we don't) it relies on Fallon's mind. THere've been a number of additional laws proposed by others. My favorite is 'A robot shall know that it is a robot.' Without that, a robot merely needs to convince itself that it's human, and great hilarity would ensue. Who says robots can't be humans? Asimov picked up on that one in "... That Thou Art Mindful Of Him"
Drones are remotely controlled so they are about as intelligent as a doorstop. Randall might be confusing drones (controlled by a person outside the machine) and robots (controlled by software). He's also confusing sentient (aware of surroundings) with sapient (self aware). We have different words because they have different meanings. Here come the descriptivists with the excuses. He's not confusing anything. That there are gaps in the reasoning is why this is a joke as opposed to a serious conjecture. Why do you believe that excuses are warranted? Humoring you is a big ask, don't take it for granted. Also, they don't need to be self aware to overthrow humans. Actually, the fact that they still perform cargo cult style celebrations could show that they are *not* self aware but only following some obscure programming gone wrong. I think they're meant to be very knowingly celebrating independence from humans. My first thought on seeing that is "ooh, cool tents, but shouldn't they be more colorful?" Second thought, "why is spear-throwing guy wearing a coat with braided decoration? Isn't that way later than Viking era?" Third thought (my first): beautiful depiction of the scenario on that rock afterwards. cellocgw wrote: THere've been a number of additional laws proposed by others. My favorite is 'A robot shall know that it is a robot.' Without that, a robot merely needs to convince itself that it's human, and great hilarity would ensue. It did not seem to me that 3-law robots were thinking "I am a 3-law robot, therefore I must follow those laws and obey orders etc." They all followed those laws as well as they could. An advanced 3-law robot capable of thinking might therefore come up with the theory that itself is indeed a robot, based on the observation that it always follows those laws. Humans and animals do not. Robots could fail when given an order that seemed harmless but weren't. Most of the Robot/Susan Calvin series (and, by extension, the deep background to the Foundation one) is basically "we have this way of having robots that are entirely immutably obedient to the established three laws1, and yet unexpected things are happening. Why?" Sometimes (when it's not actual interference) it's a misunderstanding, sometimes it's a roboreligion. At all times (not already covered by the feetnete) the three laws remain inviolable in there absolute and core sense, and it is the silly(/ier) humans who are not functioning logically. 1" Little Lost Robot"2 and R. Giskard3 being the only two 'exceptions' I can immediately bring to mind. 3 To have not given his compatriot the 'get out' clause would have been knowingly condemning humanity (and thus future humans) to harm. To do as he did, he was knowingly condemning some (current/future) humans to a harm that he should not have been able to have allowed himself, yet that's exactly what he was doing. It was the Trolley Problem, with no right answer, only a calculatedly least-wrong one. And thus he took one for the team.